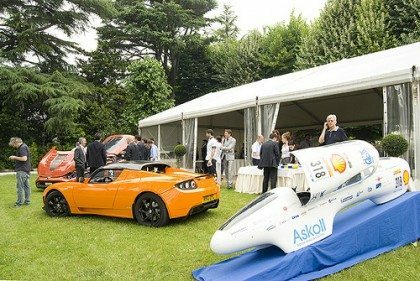 Even if we do not know – at home – we ALL have a piece of the vehicle that has won numerous awards during the Rotterdam Shell-Eco Marathon, travelling along 5,000 kilometers with 1kWh of energy (the equivalent of a liter of gasoline). 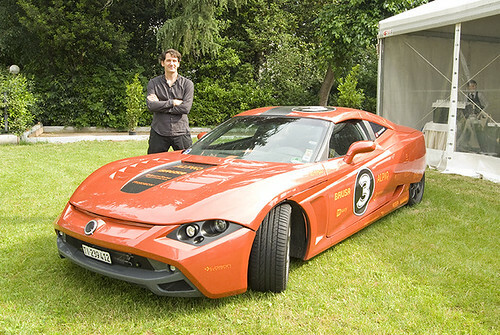 The engine of this 100% Italian vehicle – built by the school “ITIS Rossi” in Vicenza – is the motor of a… washing machine! 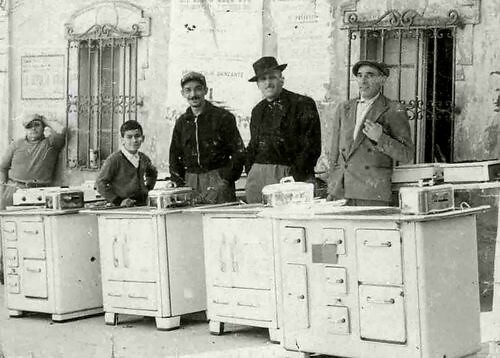 Manufactured by Askoll, the supplier of the world’s leading manufacturers of household appliances in over 20 countries. 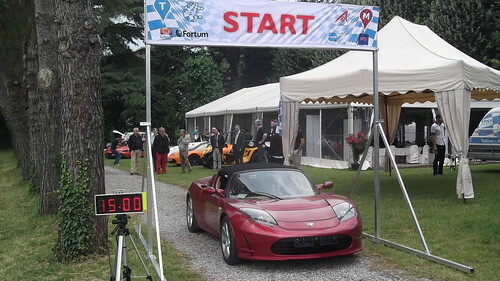 Desenzano del Garda has been – for a day – European Capital of electric mobility: the magnificent backdrop of MonteAlto events, hosted the largest concentration of electric cars ever seen in Italy: Tesla, Protoscar, ZEV, Eledrive, Askoll and all vehicles of the Tallin-Montecarlo marathon. Just a couple of days before – during Automotive Dealer Day – the representative of PSA explained that “customers want the electric car” arguing that the imminent arrival of electric cars on the market will change the way of selling cars into the dealerships. The oil producers hamper the electric car! Pasquale De Vita – President of the Association of Italian Oil Companies – explains that in 2035 the petroleum products will still continue to satisfy more than 90% of the demand of mobility of the 1,700,000,000 vehicles that will be available in the world’s streets. Twice than today! But it is certain that the demand for oil is increasing into the World, thanks to the motorization of the developing countries: within few years – in 2020 – automobiles sales in non-OECD markets will exceed those in OECD countries. PSA, Renault, Opel and Fiat well aware these predictions and are moving their plants, their assembly lines and their interests far away from Europe! The requests and the success of the electric cars depends from bonuses, contributions and discounts? 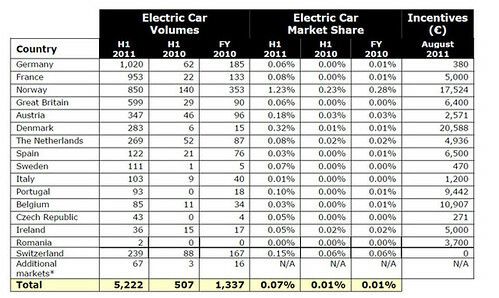 Data of Jato International show that the success of the electric car does not depend at all from the amount of government subsidies: in Norway with a contribution of more than 17,000 euro (the equivalent of 23.800 US$) in 2011 only 850 cars were sold, and in Denmark with over 20,500 euro (28.700 US$) of contributions, sales reached 283 units in 2011, for a market share of 0.01%. At the moment a proposal is in discussion at the Government: in our country who will buy electric or hybrid car will be entitled to a state subsidy. The budget is 420 million euro. Customers will receive up to 5,000 euro, with a constraint: the seller must practice a discount of 30% of the bonus. Trifles, crumbs: to buy an Opel Ampera (45,500 Euro including batteries, the equivalent of 63,700 US$) the Italian dealers will be required to make a discount of 1,500 euro: much less than what Opel and Chevrolet dealers today donate to indipendent salesmen, retailers and traders to whom they are selling Ampera and Volt discounted in the absence of serious negotiations with private clients. The Italian dealer Federation – who had nothing to complain a few months ago when Berlusconi donated 65 million to fund incentives for the purchase of electric cars – has sharply criticized this initiative: “Benefit a single technology is wrong, all the automobiles sales need a bonus”. In reality, what stride is that the text establishes a unified national infrastructure that allows the installation of charging points, as well as special rates to stimulate the market. Special rates that operators have forgotten to apply! Those who want to recharge their electric car at home are bound to sign a five-year contract (yes, 5 years) at 85 Euros per month, which will add another 25 Euros per month for public charging columns; this mean 154 US$ per month, per 5 years! Not bad for a technology that promises savings for those using it! 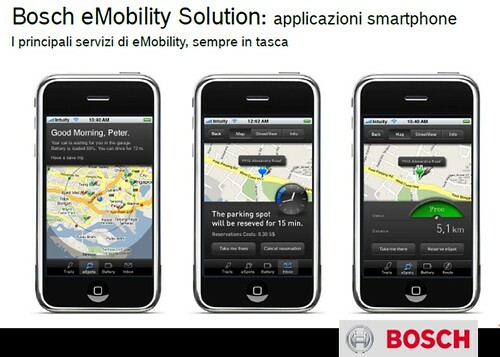 Bosch and Siemens data indicate that the technology is ready: I-Phone applications to locate charging stations, condominium charging systems, ultra-rapid induction recharging systems without the need to stop the vehicle. Today – in Italy – the charging stations are in Italy about 600, exactly how many electric cars are registered and in circulation (including those of manufacturers, NSC and dealers): a column for each car. But the columns are not equally located on the territory: Milan, Brescia, Pisa, Bolzano are well organized, but those who buy an electric vehicle in Rome, Naples or in Sicily? The automotive sector is very conservative and unwilling to innovation. Dealers and manufacturers are working exactly like 30 years ago – selling always the same polluting, expensive, smoky cars of the 70s – and the system is becoming increasingly older. At the moment the only major innovation is… Internet, but only few dealers and carmakers are using it to 100% of the potential! When cars will pollute and will consume less than a Class A appliance? Please, do not ask to the Oil Companies Associations! “The very smallest e-cars are much like e-bikes, and may be small enough that future TRAINS could add cars to house the riders e-cars to avoid rentals in city of destination. That keeps these tiny cars off the autobahns perhaps. And then there is the upcoming robotic rental cars, gps and radar guided e-cars or small diesel-e-hybrids perhaps. Taking the scenic routes automatically so driver and partner can enjoy the view and take pictures along the way? Any other comment from the Automotive Space… community? Appeal to all the ‘Alfista’: save our heaven! Dealers: welcome to interesting times! In the worst market of the last 33 years there is space for pre-owned, one-day-cars, self registrations and km zero?